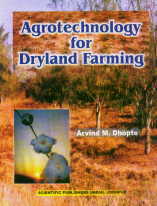 This book deals with seed, soil, watersheds, crop, weed and nutrient management, use of weather forecast, various measures to save the crop under abiotic stresses like drought and flooding, reclamation of degraded land through organic recycling, evapotranspiration, water requirement, water use efficiency, climate and moisture relation, selection of variety and crops, agrometeorological approaches, use of antitranspirants, problematic soils and corrective measures, organic recycling and in situ water management, regulation of crop growth and suitable medicinal and aromatic crops for remunerative farming under dryland conditions. Over 90% of land is under rainfed farming. The chapters in this book are written by eminent scientists who devoted their services for rainfed farming in the country. Adoption of these techniques not only results in protection of dryland crops but favour environment as well in larger interest of life and world to prevail in days to come."